An invigorating melange of flavors, textures and colors, this is an attractive dish to serve hot or at room temperature. I just love the way the corn, black-eyed peas, and greens look against the dark rice, but if brown rice is what you’ve got on hand, that will work, too. Adapted from Wild About Greens by Nava Atlas. Combine the wild or black rice in a saucepan with the broth. Bring to a simmer, then cover and simmer gently until the water is absorbed, about 40 minutes. Heat the oil in a large skillet or stir-fry pan. Add the carrots, onion, garlic, celery, and white parts of the scallion and sauté over medium heat until all are golden. Stir in the green parts of the scallion and corn. Stir in the greens, then add 1/4 cup water. Continue cooking until greens are wilted down and nearly tender, about 3 to 5 minutes. Add the black-eyed peas, vinegar, and lemon juice. Stir together and cook for a minute or two, then stir in the wild or black rice. Stir in the dill and parsley, then season with salt and pepper. Serve at once, passing around pumpkin seeds for topping individual servings if desired. Variation: Use stemmed and sliced turnip greens in place of all or part of the collards or kale. more Main Dishes Featuring Grains and/or Beans. 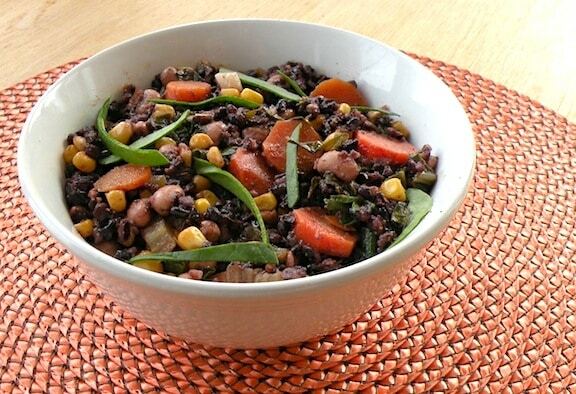 Read more at http://www.vegkitchen.com/recipes/black-rice-with-black-eyed-peas-and-greens/#aSecEWe4URI5qoS2.99 I don’t see the onion listed in the ingredients so don’t know how much to use. thanks. Karen, sorry, there’s no onion and so there was a little confusion in the directions. I made the correction and it should be all set now. Thanks for the eagle eye! Adding onions wouldn’t hurt though! Nor garlic. Robert, you’re right — and I updated the recipe. Thanks!